In this post I would like to present a solution to the practical problem of extracting a number of defined length from an alphanumeric string which may contain several numbers of varied lengths. Indeed, the inspiration behind this post is in part derived from having personally witnessed many such requests on the various Excel forums, most of which involve the extraction of e.g. an account number of fixed length, 6 digits, say, from a longish string containing many other numbers. we may wish to extract the one occurrence of a 6-digit number (123456) from that string. 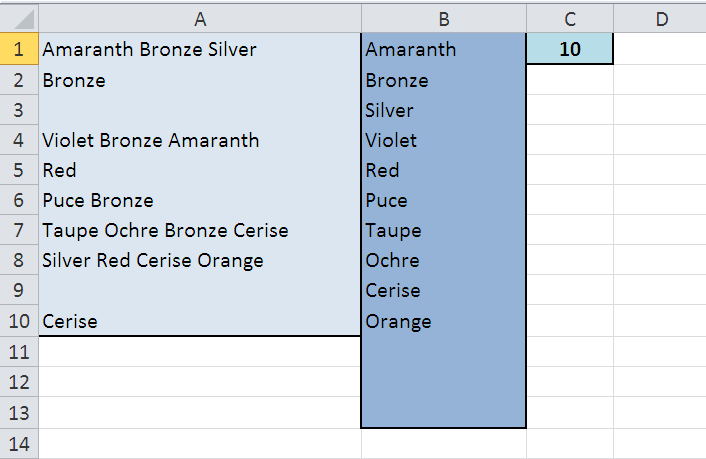 In this post I would like to present a solution to the situation in which we wish to count the number of rows for which a stipulated condition is met in at least one of several columns. which details levels of scrap nickel exports for various countries and for various years (you can download the workbook here). We are often faced with the practical situation in which we need to return the entry from a certain column which corresponds to the maximum numerical value from another column subject to one or more conditions. we may wish to return the date (column C) which corresponds to the latest version (column B) for a given order number (column A), where by “latest” we mean “largest numerically”. So congratulations to all of the above! The majority of those solutions adopted a strategy of comparing the characters from two sets of arrays derived using MID over an array of start_num parameters, though a couple of solvers (Bill and Calvin) decided to first derive the ASCII codes for these characters and instead use these as the basis for the comparison. This one provoked quite a bit of debate, and not all of it Excel-related! As I already have to several readers, I must again apologize for the lack of realism and statistical know-how inherent in the premise for this challenge, which was evidently constructed more with the required formula-work in mind than with any serious thought to methods in demography. Still, at least some fascinating and impressive Excel work came out of it all, so perhaps my poor groundwork is somewhat forgiven, at least retrospectively! At the time of writing (Saturday morning, UK time; apologies if anyone has submitted something after that date), two correct solutions received (or three if you count non-Excel-based ones: as he has done for most of the recent challenges, Isai Alvarado produced a solution applicable to Google Sheets, which, as usual, I am unable to verify! So I’m taking your word for it that it’s perfectly correct, Isai! 🙂 ). The two correct entries came courtesy of Snakehips, who gave a rather lengthy but perfectly correct solution, and John Jairo V, who improved upon his earlier attempt by producing a solution which, in essence, used a similar approach to Snakehips’ but which made use of some very nice technique involving MMULT to considerably abbreviate the required construction. Great work, John! Three solutions were offered, two of which from the same person, and both of which were correct! So many congratulations to Bill on successfully solving what was quite a complex challenge! Indeed, as Ben Schwartz pointed out, this challenge appears to have been set previously on the internet, and seems to have been only partially solved on those occasions. In any case, thanks also to Ben for his suggestion, which he confesses was cobbled together from those previous solutions he found, and which worked in all but a few exceptional cases.